Are you looking at meal delivery options and having trouble deciding which to try? If you are a foodie, Sun Basket may be the perfect option for you! Yes, I am a self-proclaimed foodie and like to try all sorts of food types from around the world. Plus the older I get the more I appreciate a healthy and tasty meal either at home or in a restaurant. To break up the mundane routine of what I normally cook (too much rotisserie chicken and salmon) and bring in more fruits and vegetables, I went in search of a meal delivery service to try. 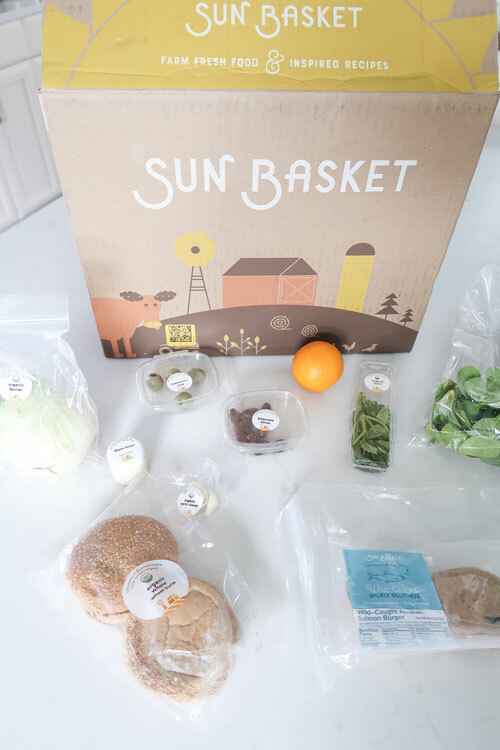 This Porch Time with Tracey, I’m going to give you my honest review of Sun Basket and why I chose this meal delivery service. There is a $40 off coupon at the bottom! Never been to Porch Time? It is when I share products or services that I think you may love too! 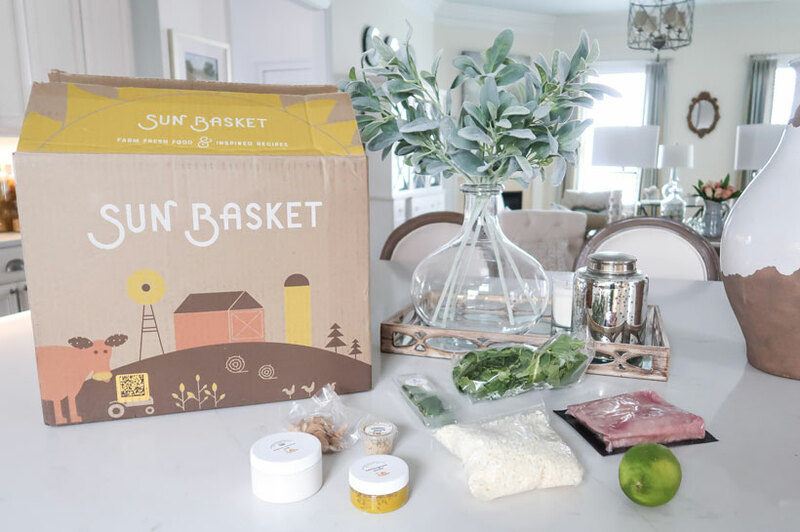 After looking at the most popular meal delivery programs, something about Sun Basket drew me into it. Top requirements on my list? Something that I’ve found helps keep my weight on track is eating clean and fresh foods. Cooking feeds my soul and eating healthy food is just more satisfying to me. Yes, I am a girl who will eat an entire frozen pizza myself, but honestly never feel good or satisfied after doing this. While I wasn’t looking for a “diet” plan, I was looking for wholesome food primarily from nature – which means very little processed food. Wow! Plus they also have a “Chef’s Choice” or Quick & Easy, with meals you can make in 30 minutes or less. That is a LOT of choices and I was loving that I could toggle between the meal plans. Plus they have this really cool app that makes it easy! The way the math breaks out the more you buy, the less the “per meal” price is. Singles and couples will pay the most for their meals at $12.99 per serving. When I go out to lunch, I’m usually paying about $10 for a not so healthy option. Or I buy $100 worth of groceries a week with much of going to waste because I have to buy full packages of things like buns or greens that go to waste. In looking at the cost, the expense for what I was getting felt like I might even save money, by not eating out as much or wasting ingredients each week. I decided on the Lean & Clean plan with 2 meals per week, for 2 people. My plan was to eat one portion for lunch and one for dinner or all for lunch, since I work from home. On their website or their app is how you order and keep track of your meals and payments. Each week, you can get a text or email, so you know the menu is live. The menu has about 18 options each week that are amazingly global and unique. 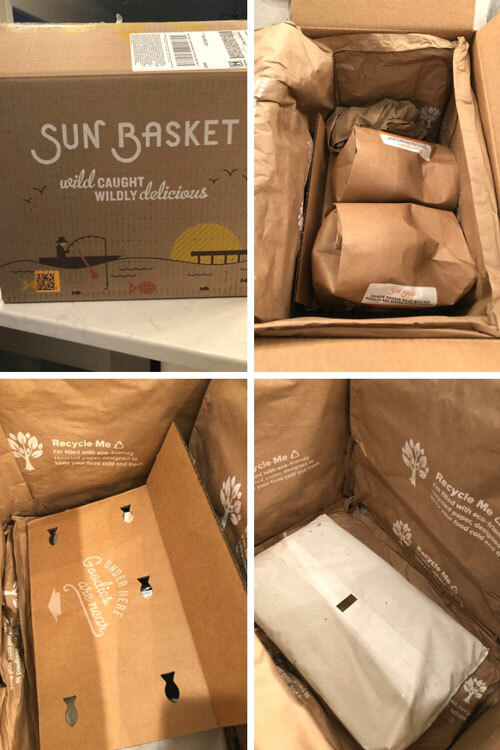 Sun Basket will pick 2 meal options for you, but I like looking through and choosing my own. You can skip a week if needed and it’s easy on the app to select “skip”. They give you 3 days of preference for what day you want your meals delivered – they all come on the same day. Shipping is smooth and easy! You get a notification text, email or you can look in the app with tracking to know when it will arrive. I have chosen Monday for my preferred day and it’s worked out well, since I typically eat out on the weekends. Only once was my delivery a day late and that was due to winter weather, when Chicago trucking hubs were closed due to extreme cold! What is amazing is how cold and fresh the ingredients arrive. The best part is the entire container is recyclable other than the plastic bag for the ice. The meat is on the bottom just under the ice and the entire box is insulated. Each meal is individually bagged and labeled for convenience – just pop everything in the refrigerator! I’ve ordered a variety of proteins: chicken, salmon, beef, turkey, and shrimp. Each one has been fresh and well sized. 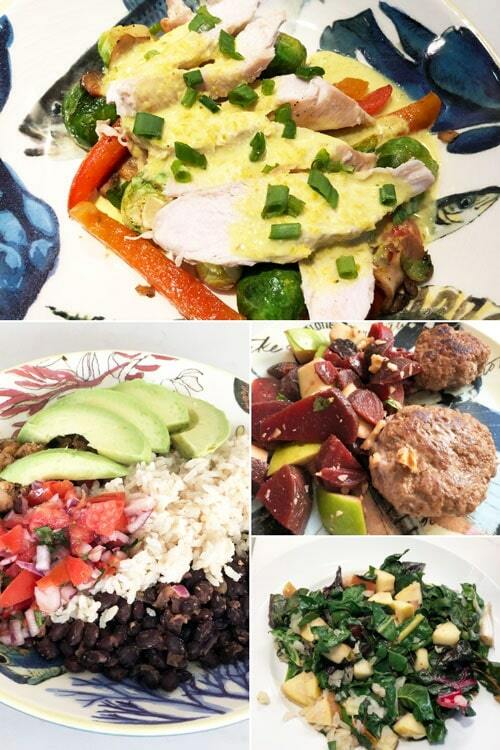 You can upgrade on most meals and most options are organic. 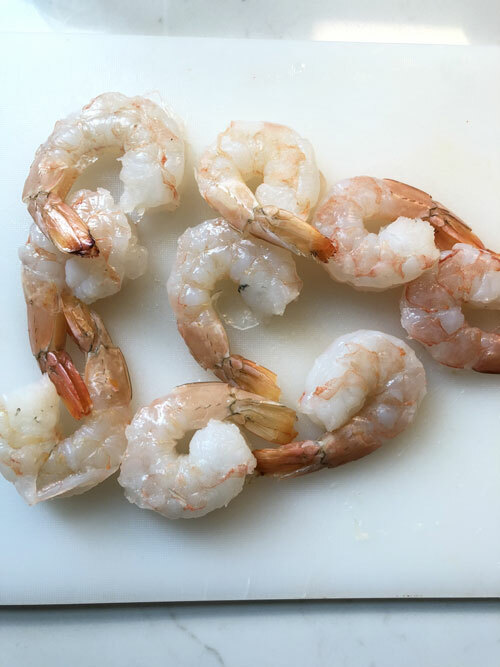 Here are the jumbo shrimp and worth the small up charge! The coolest part is how each ingredient is labeled and individually packaged. You only get what you need, so there is NO waste! Each box comes with a recipe book that you can keep. For my first meal, I was worried it wasn’t enough food. In reality, it turned out to be a LOT of food and I’ve never felt hungry (nor did my 19 year old football player son!). Chopping something is at the core of every meal, so I found having two really good knives and cutting boards came in handy. 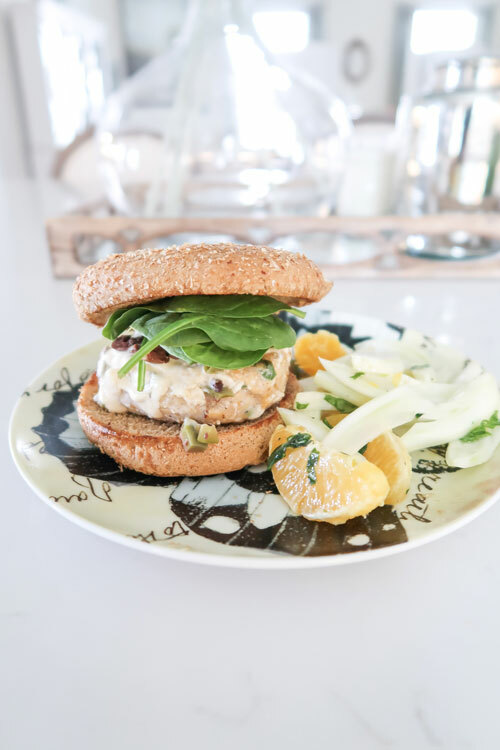 Salmon Burger, with dijon mustard and homemade tepanade. 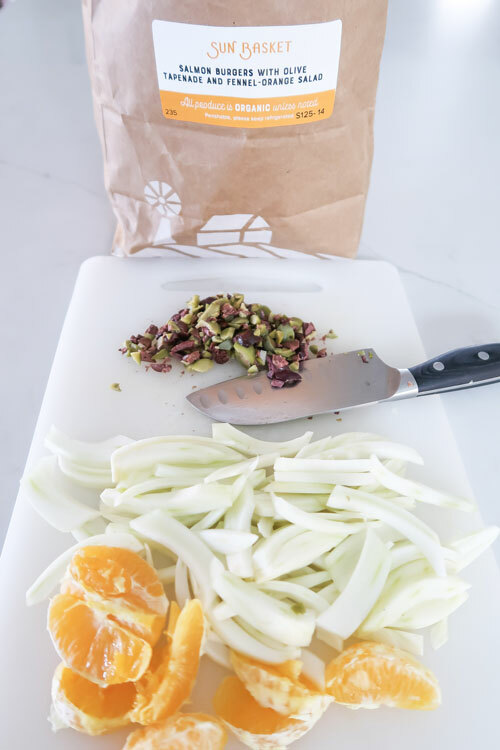 Fennel and Orange Salad. The flavors are SO savory and unique including items like fennel, which other than using as a spice have never eaten in a salad. 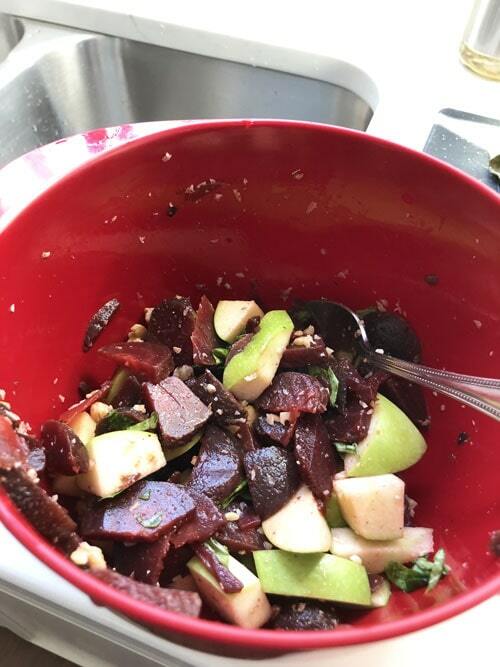 One salad mixed beets and apples, which I loved! It’s been fun to try global flavors and experience new combinations! Each recipe has introduced me to a new cooking technique or food combination, which keeps it interesting. The meals can take as little as 20 minutes to as long as 40 minutes. You can read each recipe, before selecting it for the week so you know what you are in for when preparing. If I know I have a busy week ahead, I’ll choose the “super speedy” meals and they even offer 5 minute salads! 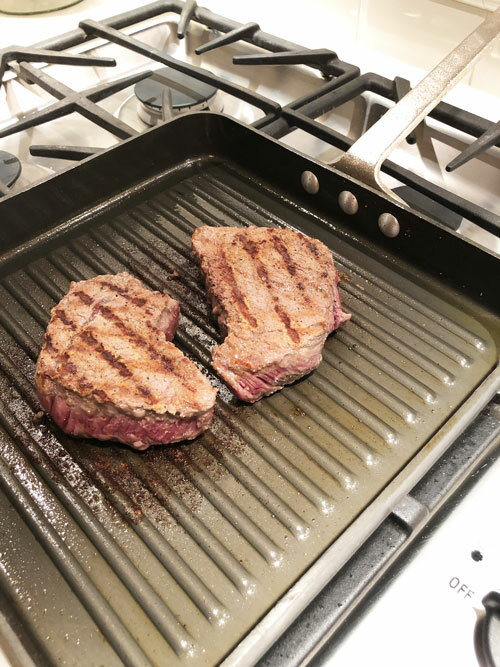 You will definitely need a basic salt and pepper shaker, along with these common cooking tools to get started. Read each recipe to make sure you have all of the cooking tools handy. Now that I’ve made 16 meals over 8 weeks from Sun Basket, I feel I can give an honest review. Honestly, it’s been one of the best decisions I’ve made for my life, budget, and health! It’s been so much fun to get back into cooking especially now that I’ve upgraded my counters to quartz, which you can read about here. I feel like a chef in a gourmet kitchen! 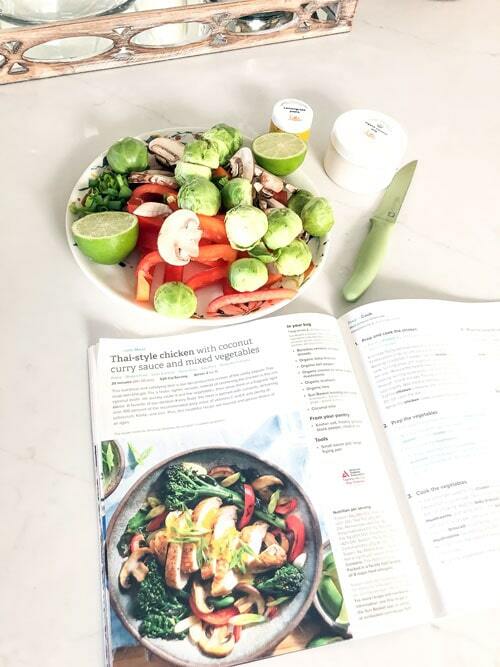 Now I regularly each a wide variety of fruits and vegetables, which wasn’t happening when I was cooking my own recipes. Honestly, I’ve saved money on this plan. I used to make the same foods over and over or eat different versions of rotisserie chicken! That was very unappealing and I would let items go to waste, in favor of eating out. It is MUCH cheaper to eat a Sun Basket meal and have a glass of wine at home! Interested in trying Sun Basket? Use this link for $40 off! It’s interesting that $60 per week for 4 to 6 servings (soup is more) has been a great budget saver! 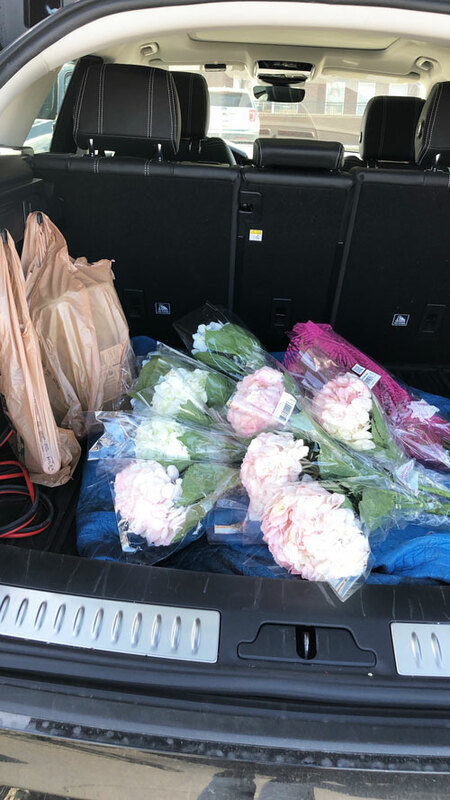 My grocery budget now is spent on breakfast, flowers and wine LOL. Here is the proof! I hope you found this helpful and even if Sun Basket isn’t for you. If nothing else, you now understand what a meal delivery service is all about. Please consider signing up for my weekly email newsletter, where I share lots of design and DIY projects along with my paint expertise.